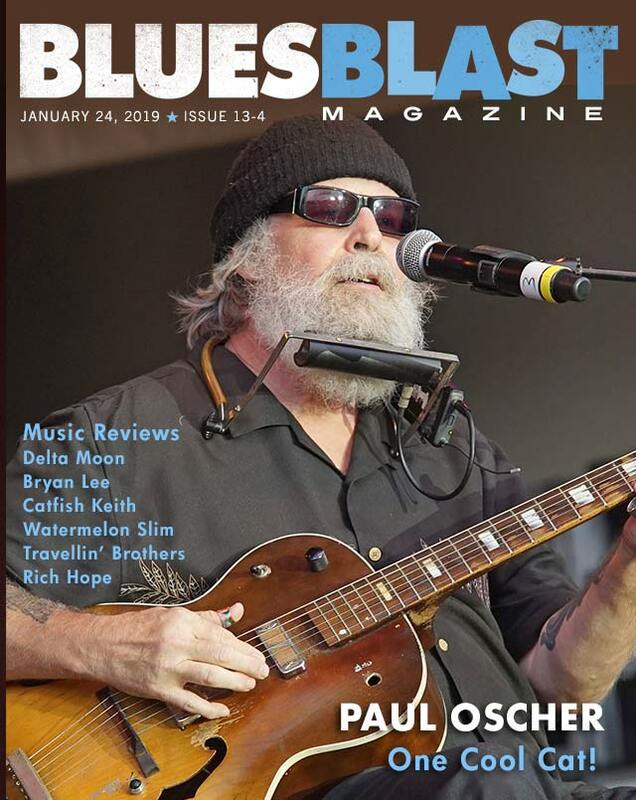 Marty Gunther has our feature interview with blues legend Paul Oscher. 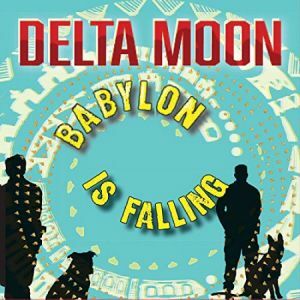 We have 6 Blues reviews for you this week including new music from Delta Moon, Bryan Lee, Catfish Keith, Watermelon Slim, Travellin’ Brothers and Rich Hope. 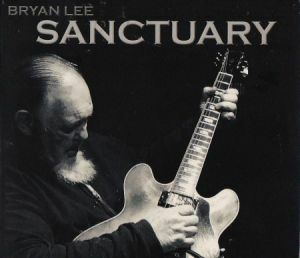 Born in Wisconsin in 1943 and currently based in New Orleans, Louisiana, Bryan Lee is one of those guys who’s been around forever, making solid records and playing all over the world. Legally blind since the age of 8, he’s also known as the “Braille Blues Daddy,” and has been a fixture on Bourbon Street since the early 1980s. 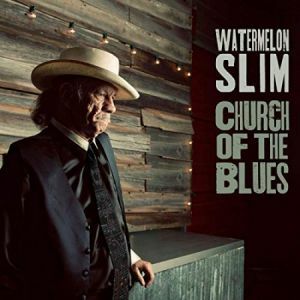 His deep interest in rock and blues music was fostered through the 1950s by the sounds he’d heard over the airwaves on Nashville-based WLAC-AM, where he first encountered classic blues artists such as Elmore James, Albert King and Albert Collins, along with the early progenitors of rock and roll. By his late teens, Lee was playing rhythm guitar in regional bands, covering the music of Elvis, Little Richard and Chuck Berry. During the 60s, Lee’s interest shifted to Chicago blues, and he soon found himself immersed in that scene, opening for some of his boyhood heroes. In 1979 he released his first album, Beauty Isn’t Always Visual. Since then, he’s gone on to release more than a dozen albums, and continues to perform in New Orleans, while also touring throughout the U.S., and more recently venturing out to Europe and South America. In 1995, Bryan shared his stage with a then 13 year old Kenny Wayne Shepherd. Lee was so blown away by the young Shepherd’s guitar playing that he invited him to play on his two Live from The Old Absinthe House CDs in ’97 and ’98. 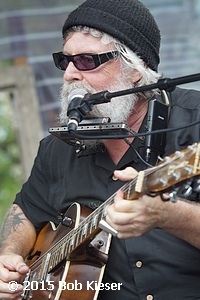 Shepherd also made a guest appearance on Lee’s 2009 CD My Lady Don’t Love My Lady, along with Buddy Guy. 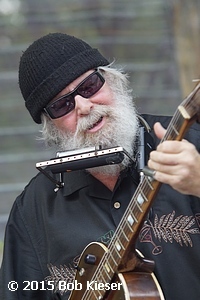 In 2007, Shepherd reciprocated by having Lee appear with him as the musical guest on Jay Leno’s The Tonight Show, helping to expose Lee’s work to a larger, younger audience. In 2010, Lee was nominated for a Grammy Award for his work on Live! In Chicago with Kenny Wayne Sheppard and Friends; the album went on to win a Blues Music Award for Best Rock Blues Album. 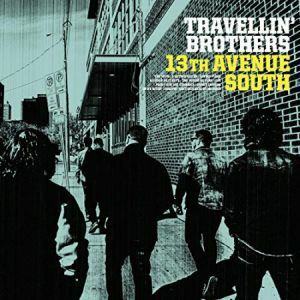 Album personnel include Lee on guitar and vocals; Deidre Fellner on backing vocals; Marc Spagone on guitar; Jack Berry and David Kasik on bass; Matt Liban on drums; Jimmy Voegeli on keyboards; Greg Koch on dobro; Steve Hamilton on percussion; Hamilton also co-produced this album with Lee. “Walk Across The Ocean” aka “Reefer Man” opens the weed set. Cab Calloway and Hos Orchestra did this in 1930 as a jump blues. Keith dials the pacing down and turns it into more of a Delta Blues. The bass adds a nice backing and Keith delivers a good slide performance on his National Duolian. “Blotted Out My Mind” is banjo player Doc Boggs inspired country blues and Keith lays out a great groove and picks sweetly on his National Radio Tone Bendaway as he sings with aplomb. 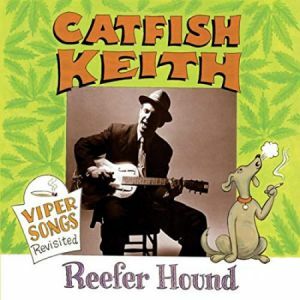 The title cut to Keith’s 2011 “Put On A Buzz” is a cool original Keith brings to this CD. His finger picking is amazing and his gritty vocals are so cool; from the album of the same title. “Lotus Blossum” is done with a 12 string guitar and the sound is big and dramatic. The mood and feel is dark and it’s just very cool stuff! “Texas Tea Party” is a Jack Teagarden song and it’s quite fun as Keith sings with gusto as he strums some wickedly interesting stuff. Trixie Smith’s “Jack, I’m Mellow” is bouncy and fun, far from mellow but well done. Catfish is such a greater picker. Bea Foote’s “Weed” is next, dark and intense enough to get a contact high from it. “Willie The Chimney Sweep” is up, a cut from Ernest Rogers. Keith tells the story well. “Cool Can Of Beer” is from his “Pepper In His Shoe!” sessions. There is some fancy finger picking here. “Weed Smoker’s Dream/Why Don’t You Do Right?” blends two versions of the same song in a cool manner. The former is Kansas Joe McCoy and the Harlem Hamfats and the latter a re-arrangement for Lil Green; Peggy Lee later recorded it and it was a hit with her and the Benny Goodman Orchestra. Django Rinehart and Stephane Grappelli’s “Back In Nagasaki” is a jumping and fun number. The title cut follows, a Curtis Jones tune. Catfish is back on 12 string and the big sound emanating from it is again amazing. The vocals are hot and quite cool. “Getting Away With Something” is a bouncy and sweet original, inspired by the great Blind Blake. Keith whispers and sings out as he blazes on the acoustic guitar. Jazz Gillum’s “Reefer Head” is some pretty blues about a guy’s woman who sleeps all the time due to her reefer use. “Mr. Crump Don’t Like It” follows with Catfish singing with authority. He plays with similar authority and gives another fine performance. Keith concludes with “Knockin’ Myself Out,” another Lil Green song. 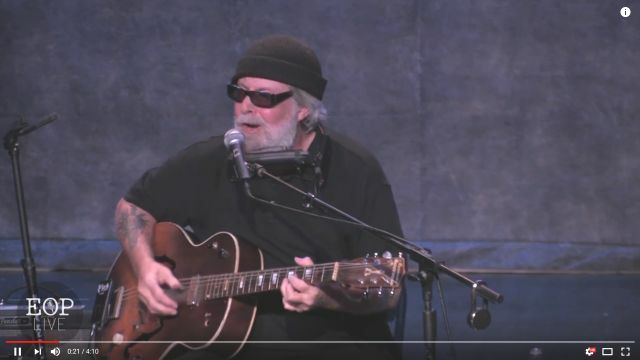 He starts out with some elegant finger picking and then gets into delivering some well done lyrics about knocking himself out gradually with weed. I must say I was impressed. When I saw 16 reefer tunes I thought, “Really?” but he pulls it off and then some! He plays a variety of guitars and I daresay few could make them sound as he does. He does some stuff I was trying to figure out how it was humanly possible to do. He’s amazing. This will be one of the top acoustic albums for this past year. Most highly recommended! 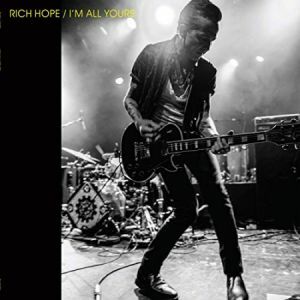 Planned Obsolescence Recording & Novelty Inc.
I’m All Yours is the fourth album from Vancouver blues-rocker, Rich Hope, and it’s an exhilarating slice of primal blues-rock. The black and white cover of the CD depicts guitarist-singer Hope in a classic rock pose: legs akimbo, hair greased back, laying into his Les Paul guitar, looking like a misplaced member of the Clash. And the opening track on the album, “It Come Alive”, is a riff-driven rock song that suggests there may not be too much blues on display. 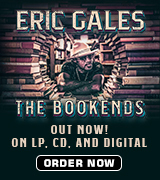 In fact, although there is a lot of rock on the album, I’m All Yours is a steamy gumbo of rock, blues, soul and pop. It is also played with such verve, abandon and utter conviction, that it is a delight to listen to. Backed by the rock-solid rhythm section of Adrian Mack on drums and backing vocals and Erik P.H. Nielsen on bass and backing vocals and Matt Kelly of keys, Hope leaves nothing out there on these performances, expertly captured by Felix Fung of Little Red Sounds studio in Vancouver. 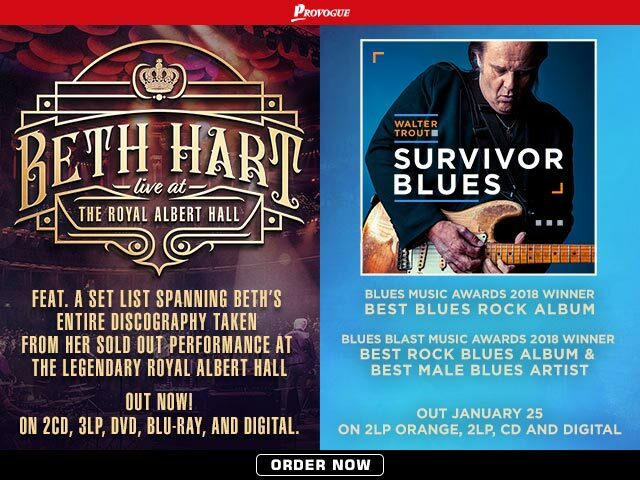 There is an atavistic thrill in listening to primal rock music played with such attitude and I’m All Yours is one of the most exciting albums heard by this reviewer recently. The core band is also supplemented at various times by Scott Smith’s pedal steel guitar, Jerry Cook’s saxophone and Derry Byrne’s trumpet. “It Come Alive” is followed by the joyous Beatles-esque rock of The Flamin’ Groovies’ “Golden Clouds” with its descending arpeggio guitar patterns, before the overcast threat of “Creepstone” and the discordant modern blues-rock grind of “La Iguana” (with a fine solo from Kelly). The magnificent country-rock-pop of “Blow Away” contains the infuriatingly catchy chorus of “Let the Heavens fall all around us. We were lucky that they never found us. I was drunker than a Lord and so were you.” It is worth commending the backing vocals throughout, which are outstanding. Hope, Nielsen and Mack wrote or co-wrote eight of the 10 songs on the album. The two covers are “Golden Clouds” and Juke Boy Bonner’s “Runnin’ Shoes” (perhaps most famously covered by the Fabulous Thunderbirds on their 1980 classic What’s The Word?). The originals lose nothing in comparison to the hallowed covers. The guitar/keyboard riff of “5 Cents A Dance” again recalls 1960s garage band rock, while the funky pop-soul of “Some Kind Of Love” contains one of Hope’s most vulnerable and endearing vocal performances. Hope’s charisma shines through every aspect of I’m All Yours, begging the question why he isn’t more well-known. A fine guitar player, he may lack the undisguised virtuosity of a Nick Curran, but he plays and sings with a similar full-bore, flat-out attitude. His slow blues, “Paranoia Blues” has a hypnotic quality that subtly disguises the smart dynamics and mature use of space and restraint. Although it’s at the rockier end of the blues-rock spectrum, I’m All Yours is a thrillingly visceral album. It oozes grease, grime, excitement and passion. 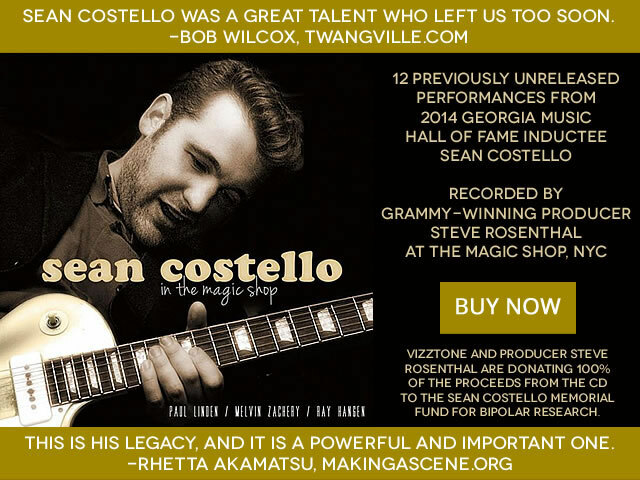 If you enjoy the likes of Steve Conte, Johnny Thunders or the rockier side of Nick Curran, you will want to check this out. It’s what rock’n’roll should be. 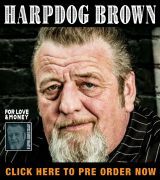 Blues Blast Magazine Senr Writer Marty Gunther has lived a blessed life. 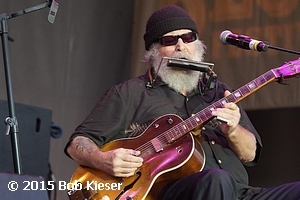 Now based out of Charlotte, N.C., his first experience with live music came at the feet of the first generation of blues legends at the Newport Folk Festivals in the 1960s. 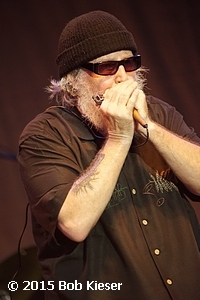 A former member of the Chicago blues community, he’s a professional journalist and blues harmonica player who co-founded the Nucklebusters, one of the hardest working bands in South Florida. Monthly shows on the second Saturday of each month at Hope and Anchor English Pub on N 2nd St in Loves Park, IL. They are 2/9/18 Mike Wheeler Band, 3/9/19 John Primer, 4/13/19 The Cash Box Kings and 5/11/19 Corey Dennison Band. All shows 8 PM to 11:30 PM. First and Third Friday’s feature the Blues at the Lyran Society Club on 4th Avenue in Rockford and a great fish fry, too! 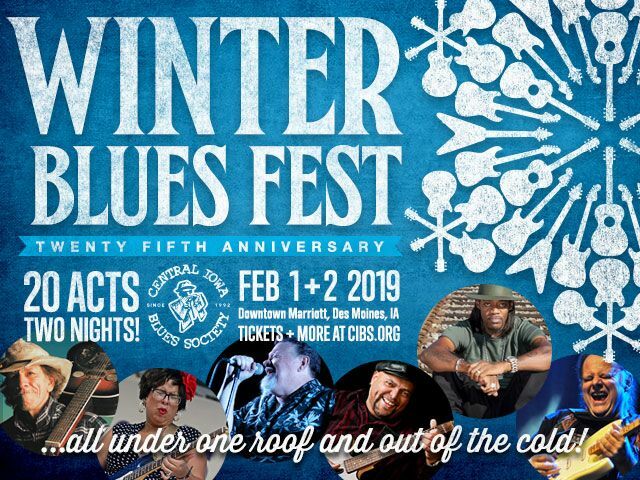 The schedule is 2/1/19 Sistah Beth Blues, 2/15/19 Recently Paroled, 3/1/19 Hobson’s Choice, 3/15/19 Milwaukee Slim with Billy Flynn, 4/5/19 Dave Fields and 4/19/19 Oscar Wilson and Joel Patterson. No cover, 7 pm to 10 pm. 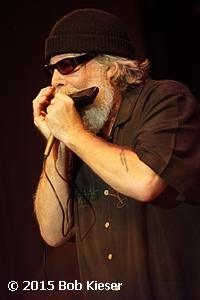 Legendary blues artist John Primer and the Real Deal Blues Band will present “The Blues According to John Primer,” a high-energy Chicago blues show, at 2:00 p.m. Sunday, February 10, at Chillicothe Public Library, 430 N. Bradley Ave., Chillicothe, IL 61523. The concert is free (donations appreciated). Attendees are encouraged to stay for a post-concert talk and Q&A with Primer about his musical life and experiences. 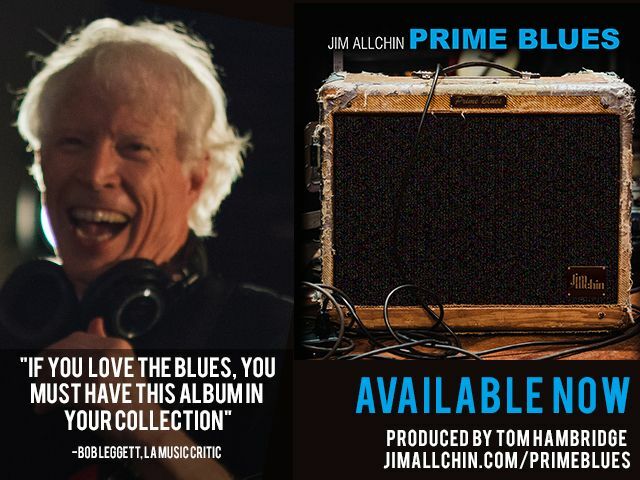 John Primer is a legend among blues artists: a two-time Grammy nominee, he helped to build the sound and style of Chicago blues over his decades-long career with his strong traditionalist blues phrasing, seasoned rhythm and blues vocals, and lightning-fast slide guitar techniques. 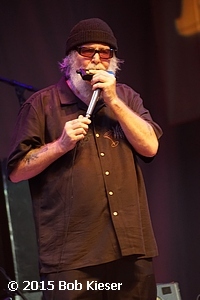 Having played or recorded with a “Who’s Who” of blues greats, Primer’s personal accolades, including a Lifetime Achievement Award, reflect his countless contributions to the history of Chicago blues. For more information, please visit www.chillipld.org or call 309-274-2719. 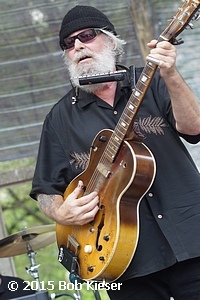 Prairie Crossroads Blues Society continues holding two Blues Jams each month. Thanks to Pipa’s Pub, 604 S. Country Fair Dr. in Champaign for hosting these jams held the 2nd Sunday of each month from 4 to 7 pm and the 4th Wednesday of each month from 7 to 10 pm. The host band plays the 1st set and then it’s open to all the jammers in the house. In February the Blues Deacons will host and Sunday March 10, we welcome back Robert Kimbrough Sr. Robert is the youngest son of Junior Kimbrough and put on an amazing show at the 2018 Prairie Crossroads Blues Fest. Bring your instrument. 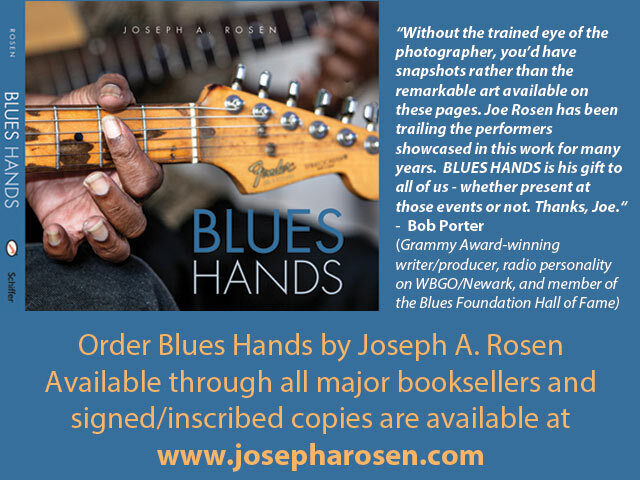 For more info visit: www.prairiecrossroadsblues.org. 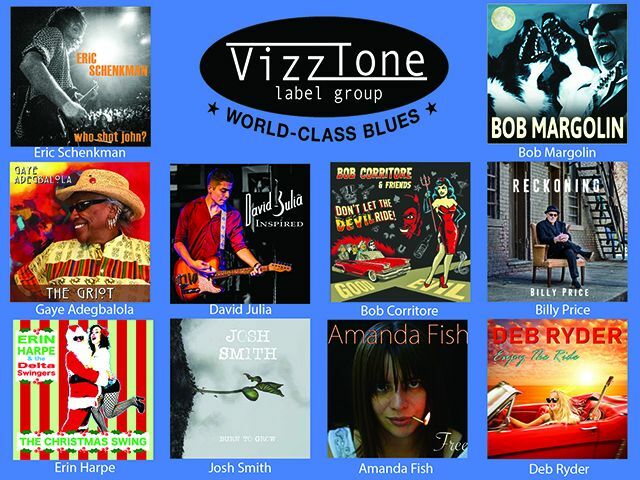 Jan 28 – Billy Galt & the Blues Deacons, Feb 2 – David Lumsden, Feb 18 – Emily Burgess, Feb 25 – The Rockin’ Jake Band, March 3 – The Nick Schnebelen Band For more information visit www.icbluesclub.org. The event will be held at the Rabbit Hole, 1801 Commonwealth Ave., Charlotte, NC 28205. Doors at 7:00, music at 8:00, to be followed by an open blues jam. Admission is free for current members with a card and just $5.00 for non-members. Like last year, we continue to collect non-perishable foods and household supplies for Loaves and Fishes. 1 Can? I Can! To celebrate 20 years of the Blues Café, we will be kicking off the weekend by hosting a 20th Anniversary Party, Friday, March 8 at the Rothschild Pavilion (near Wausau, WI). Doors will open at 5:30 pm, with Howard “Guitar” Luedtke getting things started at 6:30 and Reverend Raven & The Chain Smokin’ Altar Boys taking the stage at 8:30. 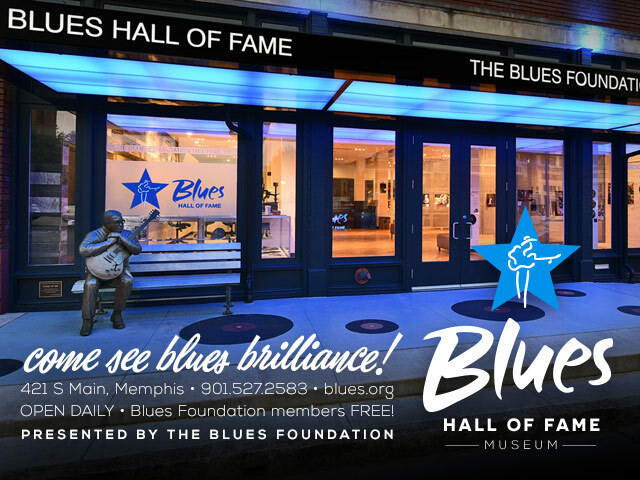 Friday admission can be bought the night of the event for $5 and is included with all Saturday Blues Café ticket, which will be available to purchase at Friday’s event. Saturday’s Blues Café lineup includes the Mark Cameron Band at 1 pm, the Ivy Ford Band at 3 pm, the Cash Box Kings at 5 pm, the Danielle Nicole Band at 7 pm, and Ronnie Baker Brooks at 9 pm. Doors will open at noon. 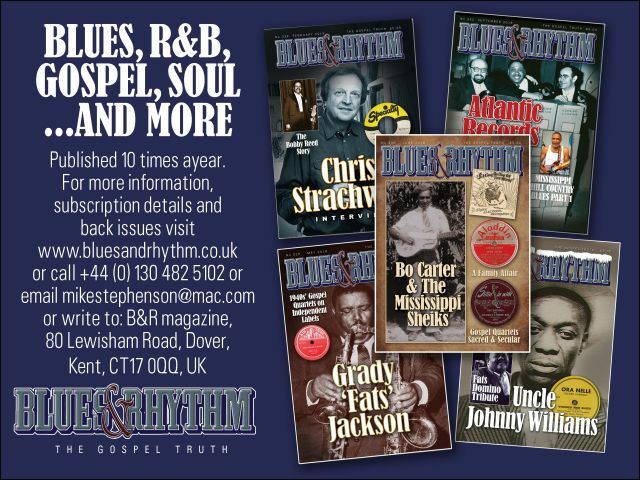 We hope you can join us for a weekend of great music, and to celebrate 20 years of good times at the Blues Café. For more information, visit gnbs.org.